For most teams, using containers in production requires you to spend time setting up and maintaining complex infrastructure. By using heroku.yml to build your Docker images, you get the power and flexibility of using Docker to package your app, combined with Heroku’s high-productivity developer experience, container orchestration, an add-ons ecosystem, and managed infrastructure. 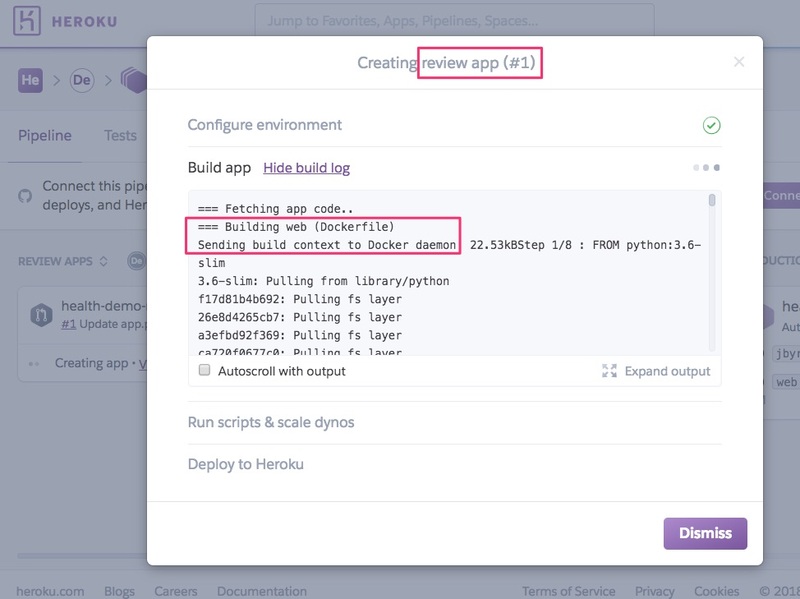 For more detail, check out the building Docker images with heroku.yml Dev Center documentation. With today’s release, your Docker-based projects can now take advantage of review apps, a powerful tool for team collaboration. Review apps allow team members to test code changes — before they are merged — on a live URL. In the following screenshot, after a pull request is created on the project’s GitHub repo, a Docker build is triggered, and a new ephemeral Heroku app is created. The app can be shared with team members for review. run - Specify process types and the commands to run. Procfile is ignored. If your team isn’t using Docker, you can also use heroku.yml with buildpacks. With today’s release, combined with Container Registry, Heroku allows you to use the tools your know and love to package your apps, while benefiting from Heroku’s high-productivity developer experience, add-ons ecosystem, and managed infrastructure. Focus on building your app with Docker, without having to roll your own container orchestration infrastructure.